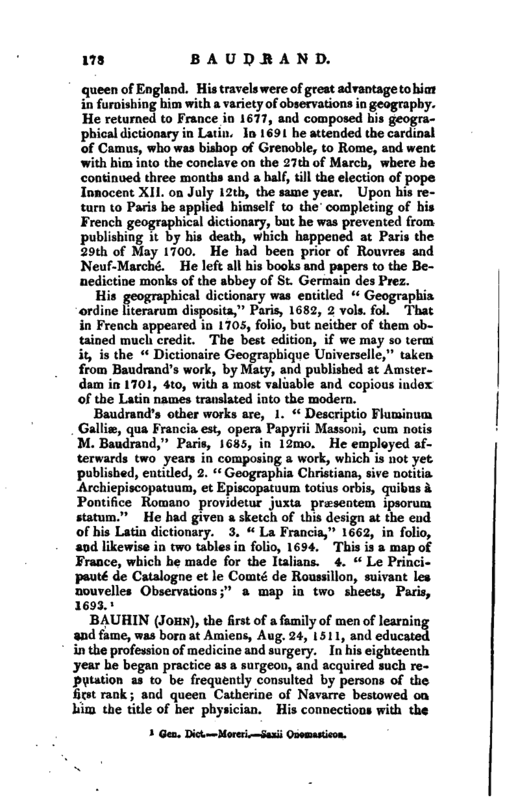 , a celebrated French geographer, was born at Paris the 28th of July, 1633. His father, Stephen Baudrand, was first deputy of the procurator-general of the court of aids, treasurer of France for Montauban, and master of the requests of his royal highness Gaston of France, and his mother’s name was Frances Caule. He began his studies in the year 1640. 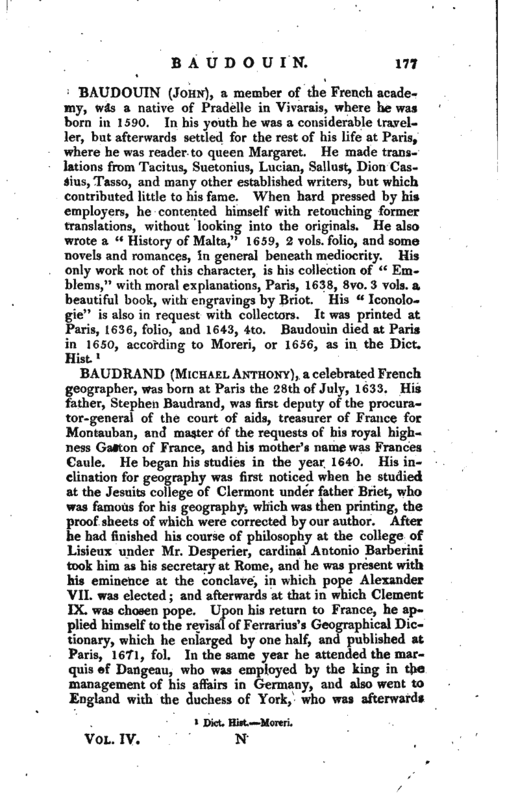 His inclination for geography was first noticed when he studied at the Jesuits college of Clermont under father Briet, who was famous for his geography, which was then printing, the proof sheets of which were corrected by our author. After he had finished his course of philosophy at the college of Lisieux under Mr. Desperier, cardinal Antonio Barberini took him as his secretary at Rome, and he was present with his eminence at the conclave, in which pope Alexander VII. was elected; and afterwards at thaHn which Clement IX. was chosen pope. Upon his return to France, he applied himself to the revisal of Ferrarius’s Geographical Dictionary, which he enlarged by one half, and published at Paris, 1671, fol. In the same year he attended the marquis of Dangeau, who was employed by the king in the management of his affairs in Germany, and also went to England with the duchess of York, who was afterwards | queen of England. His travels were of great advantage to linn in furnishing him with a variety of observations in geography. He returned to France in 1677, and composed his geographical dictionary in Latin. In 1691 he attended the cardinal of Camus, who was bishop of Grenoble, to Rome, and went with him into the conclave on the 27th of March, where he continued three months ancha half, till the election of pope Innocent XII. on July 12th, the same year. Upon his return to Paris he applied himself to the completing of his French geographical dictionary, but he was prevented from publishing it by his death, which happened at Paris the 29th of May 1700. He had been prior of Rouvres and Neuf-Marche. He left all his books and papers to the Benedictine monks of the abbey of St. Germain des Prez. His geographical dictionary was entitled “Geographia ordine literarum disposita,” Paris, 1682, 2 vols. fol. That in French appeared in 1705, folio, but neither of them obtained much credit. The best edition, if we may so term it, is the “Dictionaire Geographique Universelle,” taken from Baudrand’s work, by Maty, and published at Amsterdam in 1701, 4to, with a most valuable and copious index of the Latin names translated into the modern.